In a big software update happening next week, Intertops Poker is adding lots of new conveniences and features for tournament registration and organization, as well as customizing the look and feel of the poker room. Intertops Poker is also giving away bag loads of cash this month, so it’s a great time for anyone shopping for a new online poker home to check them out. The new poker software also features a Tournament Notifier enabling players to filter the tournament notices they receive and a Tournament Calendar to remind them about online poker tournaments they’ve registered for. Re-sizeable tables can be scaled down to industry standard minimum size and the Tournament Lobby now includes links to satellites. Players can opt to install the updated poker software or keep the current one running. While the site has been undergoing a major poker software update, the exclusive June $5000 FPP Race and $50,000 Gold Card Race have been running and will continue until the end of the month. Intertops Poker players earn Frequent Player Points whenever they are dealt cards at any real-money cash game or pay a tournament entry fee. Points are automatically converted into Gold Chips which can then be redeemed for prizes, free tournaments or as non-deposit bonuses. The top 50 point earners from June 3rd through 27th will each win a share of $5,000 in prize money. There’s another $50,000 up for grabs in the Gold Card Race which rewards real-money ring game players with cash and bonuses! More than $30,000 has already been paid out in June and there’s plenty more where that came from. Gold Cards are distributed randomly in all real-money ring games of all stakes and levels. Every Gold Card earned at the tables is worth miles on the Intertops Poker leader board. Players who make the top 50 collect up to $500 in cash or $2,500 in pending bonus every week this month. 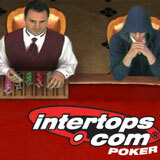 To monitor their status, players can visit the Rewards tab when logged in to the Intertops Poker client.